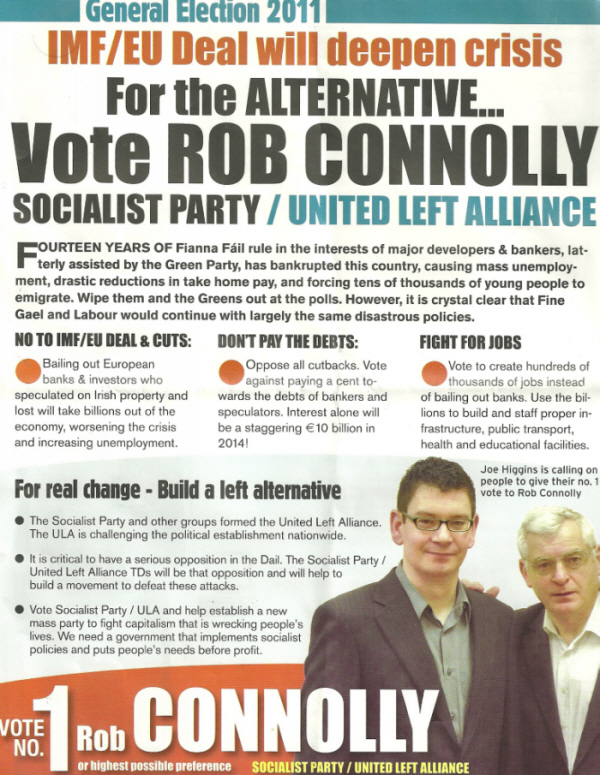 A leaflet from Dublin Mid West Socialist Party (United Left Alliance) candidate Rob Connolly. Connolly is pictured with Joe Higgins who was a TD for parts of the constituency before boundary revisions. Everybody has to get used to the pain, not only a Fianna fail about to be obliterated, Joe Higgins for instance has polled about 10% himself, and there’s no guarantee that he’ll be elected. The ULA is a new thing , we won’t know how it will fare until the count , or indeed if any ULA candidate will even be elected?